The game of tennis is played on a court 78 feet long by 27 feet wide on a variety of surfaces including clay, grass, carpet and hard. The court is divided in half by a net over which players must hit the ball. There are white baselines at each end of the court, where serves are taken and beyond which the ball must not bounce - if it does, then the ball is out and the hitter loses the point. Each side is lined with two white marks to indicate the width of the court. The inner line shows the dimensions for singles play and the outer for doubles play. Stretching from the net, to halfway down the court, there is a short white line dividing it into boxes - this is the service court. Tennis court surfaces can be built from natural or synthetic materials: natural grass, polymer fiber carpet, elastomeric rubber polymer mat, clay ceramic, or asphalt. Hard asphalt tennis courts are covered with a latex or acrylic paint containing sand. The sand increases the friction of the surface and slows down the ball. The white court lines must be precisely drawn, preventing the use of sand. 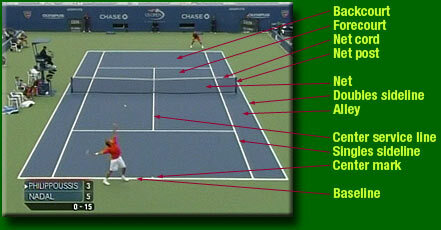 Watch carefully and you will see that balls are faster coming from court lines.